Avast! Premier is the most complete antivirus and antispyware software utility developed by Avast!. It offers a complete set of security tools that are designed to safeguard computers against a wide array of threats. Avast! Premier uses the same engine that powers the rest of Avast! Security products. However, it has several additional tools such as the ability to access your computer remotely, a powerful data shredder and an automated software update function. Of course, the application includes all essential antivirus features included in several Avast! Security programs such as quick, full or custom scan modes, web, IM and P2P shields, real-time protection, a firewall and an antispam module. The features which are only available in Avast! 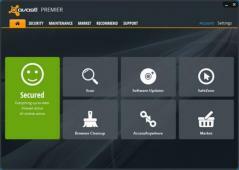 Premier are the automatic software updater tool, the data shredder which lets you permanently delete data using military-grade algorithms and the AccessAnywhere tool that’s practically a service offering remote access and control over the computers on which you have Avast! Premier installed. The antivirus software also bundles several other components meant to strengthen your online security for banking transactions and shopping, a friendly password manager, browser protection, and antispam capabilities for your email accounts.